Fiction based religions are the product of fan communities that creatively rework narratives of popular culture and formulate them as a pseudo-religious structure (Cusack, 2010). Some of these fiction based religions are Jediism which is based on Star Wars, Matrixism which is based on the Matrix movies, and the Churches of Helix and Dome which are based on Twitch Plays Pokémon. The unique context of the social and spiritual formulation of fiction based religions leads to the investigation of their function, and what they bring to the people participating in their creation, development and use for community and narrative purposes. The framing they receive within the literature can fall under different categorizations which offer different understanding of their function and use. These categorizations come in the form of invented religions (Cusack, 2010), hyper-real religions (Schorey, 2016; Possamai, 2012), New Age or spiritual supermarket (Aupers & Houtman, 2010; Hanegraaff, 2000; O’Leary, 1996), Folklore (Hansen, 2009; Gillis, 2011), or even civil religions (Simpson, 1984). Each of these categories offers a different take on the phenomenon. This consideration of the literature raised the following question: To what extent do these fiction based religion fulfill a spiritual function of believing or a social function of belonging? 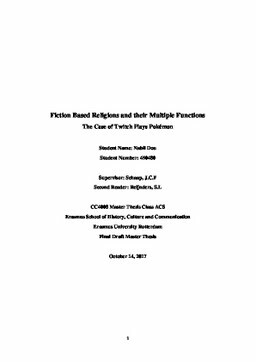 In this research, a qualitative approach was opted for in order to investigate the specific case of the Twitch Plays Pokémon religions. The aim of the research was to define the perspective of participants on the function of the fiction based religion that they are part of, either religious and spiritual, or social and creative. This approach enabled a general classification of the participants that was developed into a more fleshed out typology with the following main categories: Religious convergence, Religious separatism, Non-religious relatability, and Non-religious detachment. These categories best describe the attitudes of the participants towards the religious nature of their fiction based religions, and also showcases the different alternative functions attached to them.